The word from Europe is that Nikon is planing a press event in at least one European country during the week of August 16th-20th, 2010. 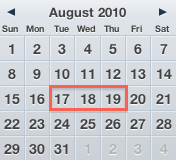 We can eliminate Monday and Friday, since those are not preferred days for new product announcements, which leaves us with August 17th, 18th and 19th as a potential announcement dates. I do not know if this is going to be the first, the second or the only press conference Nikon will have before Photokina (two years ago, the AF-S 50mm f/1.4 lens was announced on the first day of Photokina and yes, it was a Monday). I also don't know what will be announced in August - for now, the candidates are new Coolpix cameras, new lenses, D3100 and D90 replacement (the Nikon EVIL system should be announced at Photokina). No word yet for a D700 replacement. This entry was posted in Nikon D3100, Nikon D7000, Nikon Lenses. Bookmark the permalink. Trackbacks are closed, but you can post a comment.